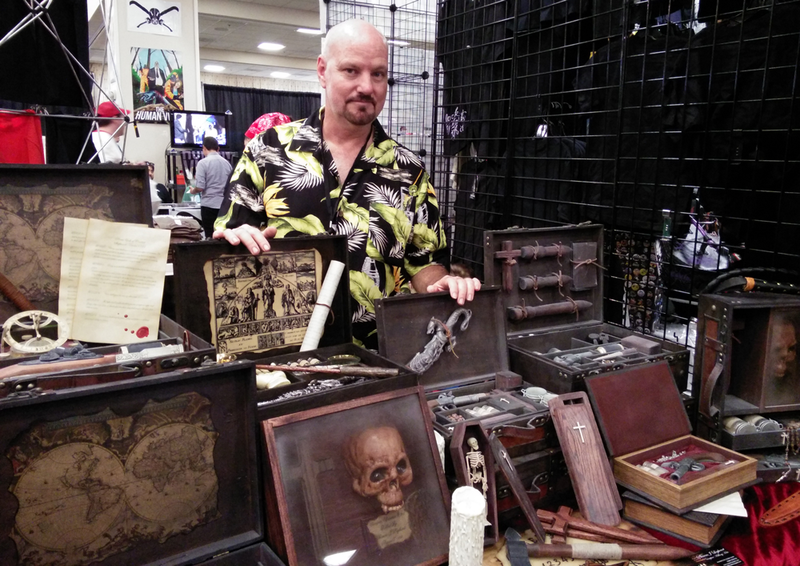 Vampire killing kit maker, “Phineas J Legheart,” posing with his wares at Spooky Empire’s May-Hem convention, held at The DoubleTree By Hilton at Universal, Orlando, Fla., 2014. Photo: Cheryl Manning. Legheart makes retro vampire killing kits for a living. He’s at the forefront of what I’ve called “The Blomberg Effect,” where the successful trade in supposedly 19th century vintage vampire killing kits has inspired prop-makers to manufacture their own versions to cater to the niche. I named the movement after the fictitious Prof. Ernst Blomberg, who’s often associated with “genuine” antique killing kits. Close-up shot of Phineas J Legheart’s “The Bastille,” complete with replica non-firing 1849 Navy Pistol. 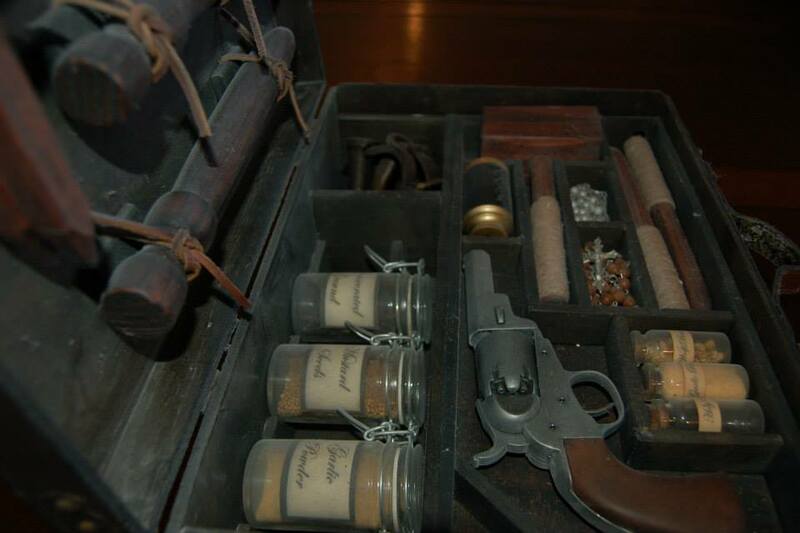 Photo: Phineas J Legheart Vampire Killing Kits/Facebook. Many kit designers adopt personas similar to 19th century snakeoil salesmen to maintain the vintage pretence. Legheart’s no exception. But the difference between these manufacturers and the people who buy their props is that they’re both in on the joke—which is more that can be said for the actual “19th century” vampire killing kit trade where auction bidders are bilked thousands of dollars for modern-day forgeries. 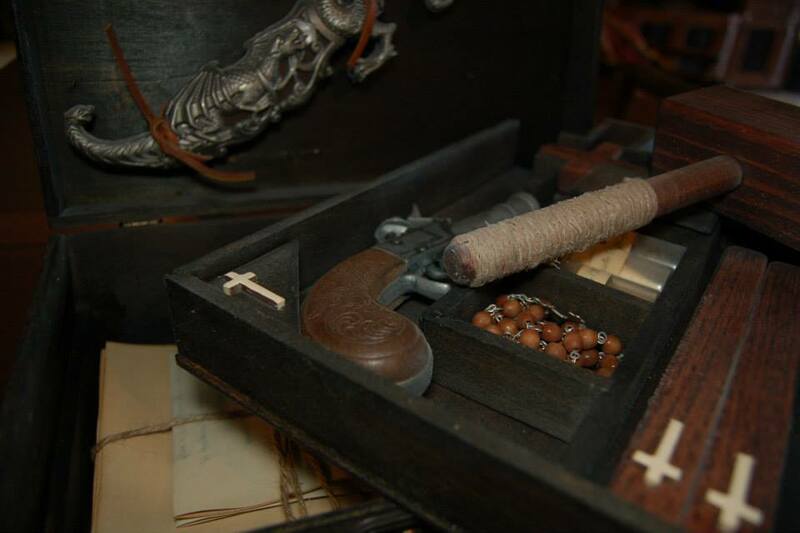 Close-up shot of Phineas J Legheart’s “The Professional,” complete with replica non-firing flintlock pistol. Photo: Phineas J Legheart Vampire Killing Kits/Facebook. Erin put me in touch with Legheart for an interview, as I was keen to get an inside view into the world of “antique” vampire killing kit trade. What kind of person makes them? What kind of person buys them? Why are they so popular? I emailed him my questions on April 3. His replies arrived on the 15th. Anthony Hogg: Long shot, but I’m guessing “Phineas J Legheart” isn’t your real name and you’re not actually a vampire hunter, despite what your site and LinkedIn profile say. Are you willing to disclose your real name, what inspired “Phineas” and what you do when you’re not making vampire killing kits for sale? Phineas J Legheart: Hi Anthony, Thanks for taking the time to interview me. Yes, you are right, my name is Walter Manning and I am officially the “assistant” to the vampire hunter Phineas J Legheart. I made up the name Phineas J Legheart in hopes it would inspire more fear in the hearts of the vampire than a name like Walter ever could. I thought a 175 year old vampire hunter added a bit of mystery to the company. I have found that my customers love the Phineas persona and get a kick out of the emails and aged letters from Phineas. I try not to break character with my customers in my correspondence with them. Phineas J Legheart Vampire Killing kits is my current full time job and it keeps me busy as I am a one man operation. AH: How long have you been making these kits? What inspired you to get into the vampire killing kit trade? PJL: I have been doing props for quite a long time, mostly for my yard haunt at Halloween. But I didn’t get into making vampire killing kits until just a few years ago. I was fascinated by the layouts and the aged look and feel of those kits claiming to be real. I couldn’t afford the $10,000 price tag so I thought I would build my own. When I made mine I had several requests to buy it, so not willing to part with it, I thought I would build one to sell. I was surprised when my first kit sold on ebay within a few hours. After that experience I made another and another each of which sold as fast. I had so much fun making and selling them that I built my own website to handle the business and formed an LLC. AH: Can you walk us through the process of making one of your kits? How long does a kit typically take from conception to design? I’m also wondering where you get their names from; you sell kits called “Vampire Tears,” “The Bastille,” “The Inquisitor,” among others. Do your kits have their own specific personalities? PJL: A larger kit usually takes about 4 to 5 days to build, although I usually build several at one time. As for naming them, you are right. Tthe [sic] names come from the personality of the kits. The Bastille because its the largest and has the most weapons, the Inquisitor because it has a vampire skull and papers on research done on the vampire’s physical traits. The Scholar because it’s contained in a false book. I try to find a name that I feel is descriptive but also adds mystery to the kit. I see that you’ve built props for The Mortal Instruments: City of Bones (2013). What were the props you made and how’d you get involved with the movie in the first place? Tell us about your experience working on the movie. PJL: Yes, I was lucky enough to have some props in the movie. I was contacted by Jim Murray, who was the Prop Master for the movie. He came across my vampire stakes on etsy and wanted me to make him some for the movie. He was amazingly nice and very patient as I had never done props for a movie before, and I’m sure I had far too many questions. It was exciting to be even a small part of a feature film. I quickly pulled together a catalog of my stuff ( I didn’t have one at that time) and sent it to him hoping to sell him a few more items. In the end he purchased several items from me. I had several stakes, some aged vials, and a hand aged vampire hunting manual make it into the final movie. You can see them attached to the inside of the lid in the giant vampire killing kit they open in the movie. It wasn’t a huge sale but it was very exciting especially when I say [sic] my props on the big screen. My family and friends threw me a party to celebrate when the movie opened and most of the people in the theater at the time were with our party. When the scene came on and the vampire kit was opened revealing some of my props we all cheered, leaving the rest of the theater a bit confused as to what they had missed. In the end my contribution didn’t get my name in the credits ( a big disappointment) but it did give me the right to list The Mortal Instruments as a movie I made props for and the fun and excitement of seeing my props on the screen every time I watch the movie. I hope to hear from Jim next time he needs some vampire killing props for one of his movies. AH: Would it be fair to say you want to be known as the go-to manufacturer of vampire killing kits? Is that why you secured vampirekillingkits.com as your site’s URL? PJL: Absolutely! When people think vampire killing kits I want them to think Phineas J Legheart. I just recently purchased the vampirekillingkits.com url from a competitor I respected a lot. He did all custom kits, and his work was amazing. He decided to leave the industry for personal reasons, and I was honored that he was willing to sell the URL to me. It’s a great URL and so the purchase was a no brainer. Prior to that I had and still do have mysteriouspast.com and vampirekits.com and have had them from the beginning. What’s your opinion on the authenticity of “antique” vampire killing kits, most often dated to the 19th century, displayed in various museums (particularly Ripley’s) and sold for thousands of dollars through auctions? Have you ever come across a genuine example? If so, what made you think it was “legit”? Have any of your kits been sold through an auction or to a museum? PJL: I have sold a kit to a museum, but it was only for display as an example. They knew it was not an antique and had no intention of passing it off as one. As for the “antiques” floating around out there. . .well, I think there might be a few legit antiques but I doubt there are as many as are being sold as such. If that were true the streets would have been littered with them back then and I doubt that was the case. I have seen the kit at the Ripley’s Believe It or Not museum and and think it was an interesting example. However, I have no idea as to it’s authenticity. AH: Your most popular kit is “The Professional,” which sells for US$295 through your website. Why do you think it’s more popular than your other vampire killing kits? 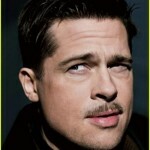 PJL: Actually, lately The Bastille has caught up to The Professional in popularity. I think the reason for both is that they both give you a lot of bang for your buck. They both have a great look and feel and most people love the hidden compartment with the hand aged vampire hunting manual. I think the Bastille is my favorite all time kit and I’m pleased that it’s finally being noticed by my customers. It’s popularity started to rise when I increased the amount of aging I did to the kit increasing its dusty look. A funny story about is that it was Dee Snider of Twisted Sister that made the recommendation that I age the kit more. He was a guest at Spooky Empire and stopped by my table to check out my kits. He is an amazingly nice guy. He said he always liked vampire killing kits and had mentioned that his wife had just recently got him a vampire killing kit for Christmas (sadly form another artist) and he loved it because of all the aging done to it. He pointed at my Bastille kit and said that he liked it but it needed to look older. Well, I was already considering increasing the aged look of the kit, after getting feedback from other customers, but now with rock star Dee Snider agreeing I had no choice but to comply. The kit has been growing in popularity ever since. I wish I had the opportunity to consult him on a regular basis. 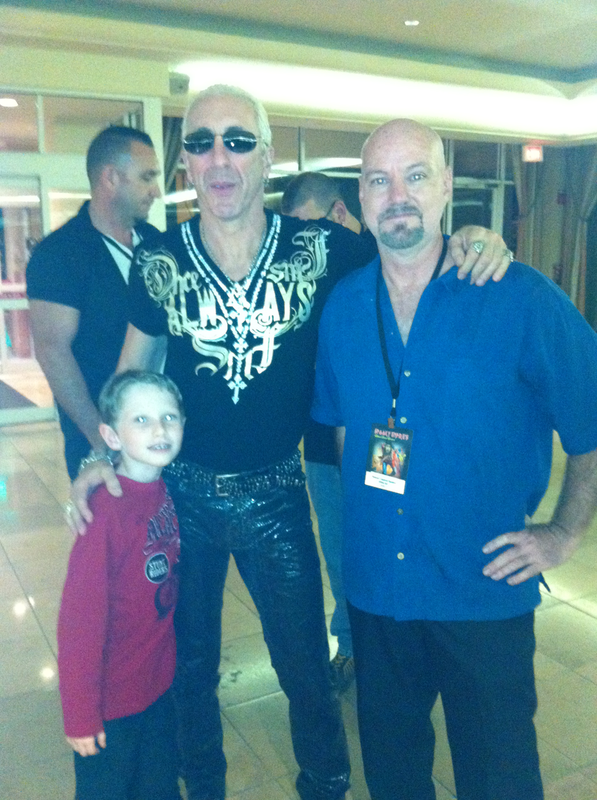 Walter (and son) posing with Twisted Sister’s frontman, Dee Snider at Spooky Empire’s Ultimate Horror Weekend, held at The DoubleTree By Hilton at Universal, Orlando, Fla., 2013. Photo: Cheryl Manning. AH: How many kits do you sell a year? Do you sell enough for vampire killing kit manufacture and design to be a full-time occupation? PJL: I sell many, many kits a year and yes this is my full-time occupation. I don’t know how long this will last but I can say this is the greatest and hardest job I have ever had. When getting ready for a show, i.e. Spooky Empire, I usually am working 7 days a week and about 18 hours a day for months leading up to it. I also find myself really busy for Christmas, my busiest time of the year, even more so then Halloween. I also sell many as birthday gifts. AH: Outside your website, can you tell us how you market these kits? What kind of “audience” or buyer do you go for? What kind of person buys your kits? Is there a “typical” buyer? PJL: The majority of my sales come from my website. I sell a surprising amount to Europe. I also usually have a table at Spooky Empires Ultimate horror weekends (although I may miss this next one). It gives me a chance to meet the people who buy my kits and give me feedback. I’m always surprised at the variety of people who buy my kits. They seem to come from all walks of life with only thing they have in common is the love of horror, Halloween, and that they are all some of the nicest people I have ever met. Most of my customers look as at home in a business meeting as they do at a horror convention. AH: There’s a lot of competition in the vampire killing kit trade. You’ve got kits selling for thousands in auctions, home manufacturers, there’s plenty on eBay and Etsy. I even notice you have a page there. Do you feel the “pinch” from your competitors? How do you thrive in a saturated market? PJL: Yes, when I started there were only two other vampire killing kit manufacturers that I considered competition. They both put out an excellent product with their own unique style. But now there are quite a few out there trying to make a quick buck and selling inferior products. I don’t worry about them as they tend to come and go and don’t have what it takes to stay in business long. Customer satisfaction is very important to me as I put a lot of myself in every kit I make. I always want my customer to be more excited when he or she opens the package I ship to them then they were when they ordered it. AH: Your website mentions that you also sell “Zombie Kits,” “Wizard, Witch, and Alchemy Kits,” “Beastly Babes Framed Art,” “Cool Stuff from the Dark Side,” and “Pirate Gear.” Are the vampire killing kits your biggest seller? If so, what’s the order of your other biggest sellers? PJL: Yes, vampire killing kits are by far my biggest seller. I just like to try different things to keep my mind going but nothing comes close to the sales of the vampire killing kits. I was suprised the Zombie Kits didn’t sell well. My guess is that my signature turn of the century styling didn’t fit well with the zombie appocolypse [sic]. I am discontinuing the zombie kits. The Beastly Babes are on their way out as well. I seemed to be the only one amused by them. The best thing they did was show me I should stick to what I’m good at. The Wizard, Witch, and Alchemy Kits were fun, but just got too expensive and time consuming to make. For that reason, I discontinued them. The Pirate Gear is new and I have high hopes for them. I did a lot of research, as I do with my vampire killing kits, and tried to make them authentic to what a pirate captain might bring on board in his personal chest during the 1600s. I think they are some of my best work. AH: Do you do custom kits? If so, have you had any unusual requests? PJL: Usually I don’t do custom kits. As for unusual requests, I am asked all the time to build a kit that can kill sparkly vampires but I always reply that the only thing that can kill that particular brand of vampire is a poor showing at the box office. AH: Do you intend on developing more products to sell through your site, or maybe branching out into other areas like merch, books, more media? What’s next for Phineas? If you’re interested in purchasing Walter “Phineas J Legheart” Manning’s kits, visit his website for further information. For more coverage on vampire killing kits read “Another ‘Blomberg’ Sold: Business as Usual in the ‘Antique’ Vampire Killing Kit Trade” (Nov. 22, 2014).